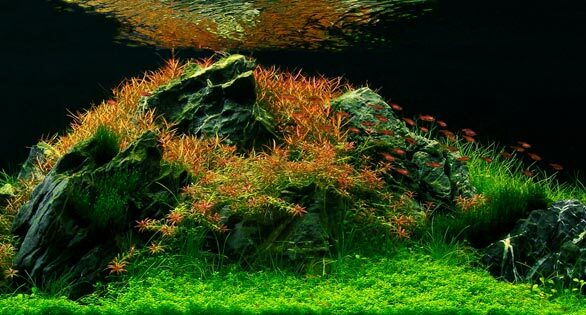 In the world of planted aquariums and the art of aquascaping, there are quite a few styles that are commonly used among aquascapers. Each style has their own unique characteristics that bring beauty and creativity to a planted aquarium. Some may favor those who are beginning the planted aquarium hobby, where as others may be for the more skilled and experienced enthusiasts. With that being said, lets take a look at few aquascaping styles that are used when setting up an aquascape and find out which style you prefer. The Dutch style was the first style ever used and attempted for a planted aquarium. This style was developed in the Netherlands since the 1930’s, which have been around for quite some time and still exists and used among aquascapers today. The principles behind the Dutch style technique consist of using many plants; specifically stem plants of no more than 10-12 species, to create a lush arrangement. The use of stem plants in the Dutch style are grouped and neatly planted in rows from back to front. Choosing a selection of plants with diverse sizes, leaf colors, textures, and growth rates are important when creating a Dutch style planted aquarium. These plants should be carefully organized so that there is a contrast in color, leaf size, and texture between each type of plant. Depending on what type of plants you use, the placement of your plants should also be at different heights to provide depth and create focal points. To create the lush look with your stem plants, you will need to heavily trim your plants periodically and provide them with a good amount of nutrients. The second style of planted aquariums have equally much to do with fulfilling the human desire to grow things, and like the Dutch aquariums, these underwater gardens are also created to bring the beauty of nature into limited indoor spaces. They are known as ‘Nature Aquariums’ and have come into being because of the amazing creativity of an artistic Japanese photographer, internationally known simply as Amano. Takashi Amano not only uses his imagination, but always bases his aquascaping designs on snapshots of nature and brings them inside with the typical knack of a Japanese master gardener. Imagine walking in a forest, or somewhere in a glade and happening on a little (or large) scene that for a moment enthrals you and takes your breath away. This is what Amano does… and what he copies. 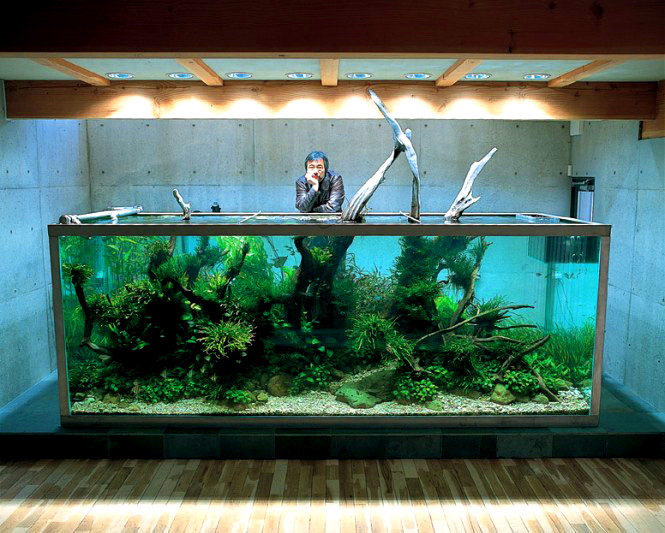 He transplants his magic scenes into almost zen-like aquariums that have the most wonderful meditative qualities. Again there are various different styles and certain set rules that determine what makes a beautiful, balanced Amano style ‘Nature Aquarium’. These are of course challenging, but for its sheer creativity, the style has adherents across the entire world. The competitive spirit amongst fans of the style is alive here too, and finally, after many regional events, culminates in a huge international competition/display event. Some hobbyists also refer to a “jungle” (or “wild jungle”) style, separate from either the Dutch or nature styles, and incorporating some of the features of them both. Bold, coarser leaf shapes, such as Echinodorus bleheri, are used to provide a wild, untamed appearance. Jungle aquascape – a challenge with large-leaved plants, limited visible decorating materials and a few open spaces, the challenge lies in avoiding the layout’s ending up in chaos. The use of large-leaved plants, tall plants that reach the surface and floating plants form the thick growth at the top to create this wild, natural look. Use small and medium-sized plants in the foreground. Many variants and different leave textures are used to catch and keep the attention of bystanders. 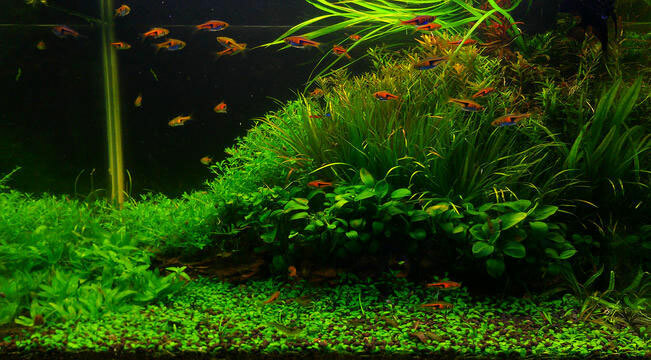 The large plant mass is a good hiding place for fish and provides good balance in the aquarium. Shift the harscape and taller plants from the edge of the tank more towards the middle, curtail your use of foreground plants, and you have what is called an Island Scape. Island scapes will often use plant collections to immitate the look of a tree stump surrounded by various species (mosses, ferns, etc). The plants are selected to compliment the hardscape, which is typically wood. The scarcer large living spaces become, the more aquascapers must innovate to keep on having their hobby. This led to a new genre of aquascaping under the collective name of nano-tanks. 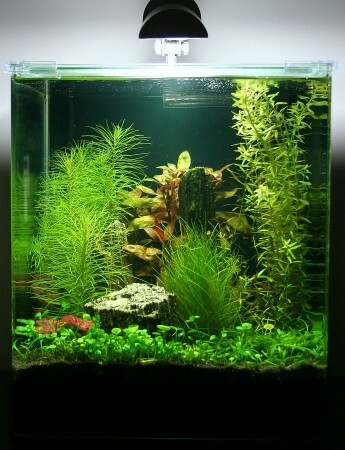 Nano-tanks are small aquariums, and can have less, but should not have more than 30 litres of water. You can follow any of the aquascaping disciplines in a nano tank; there are no restrictions. Lately, though, there is a trend to cultivate a collection of nano-tanks, and to enter them as small ‘show’ tanks into competitions, when they are then called ‘nature art’. They are usually dedicated to the scene rather than inhabitants, so they often display exceptionally beautiful rocks, but they can also be used to display beautiful shrimps or small species of fish. Both choices are especially popular in Asia. Also new on the scene is a style called Wabi Kusa, which when used in thge context of aquascaping literally translated means ‘tiny nature’. Reminiscent of terrariums, these are miniature aquascapes which cater to the increasing scarcity of space. 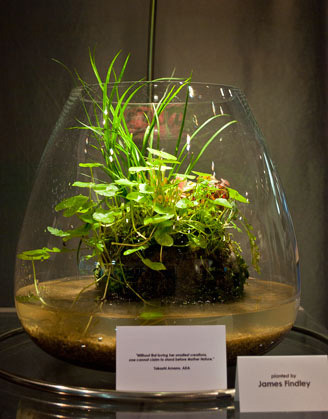 Wabi Kusa involve balls of substrate that are covered with plants that are grown in their terrestrial, or ‘emersed’ rather than ‘submersed’ form, very similar to plants that are grown hydroponically in nurseries. These substrate balls are placed directly into a small glass container with some water and then allowed to grow naturally. This approach is very different from aquascaping techniques, where the layout of the aquarium is planned with exquisite care and the plants are carefully maintained. Wabi-kusa allow nature to flow freely, and as such they produce stunning results. 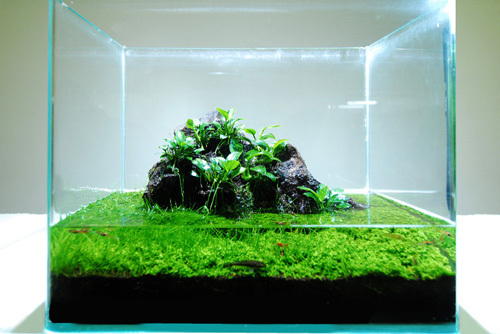 For that reason there is a trend to create Wabi Kusa in what is known as nano-tanks, a little larger than just glass containers, but desktop-size nevertheless. In essence, Wabi-kusa is a celebration of the wildness and chaos of nature, but also of the impermanence of all things – and is evocative, extremely seductive and inspiring – a piece of untamed wilderness in your home, bedroom or office.